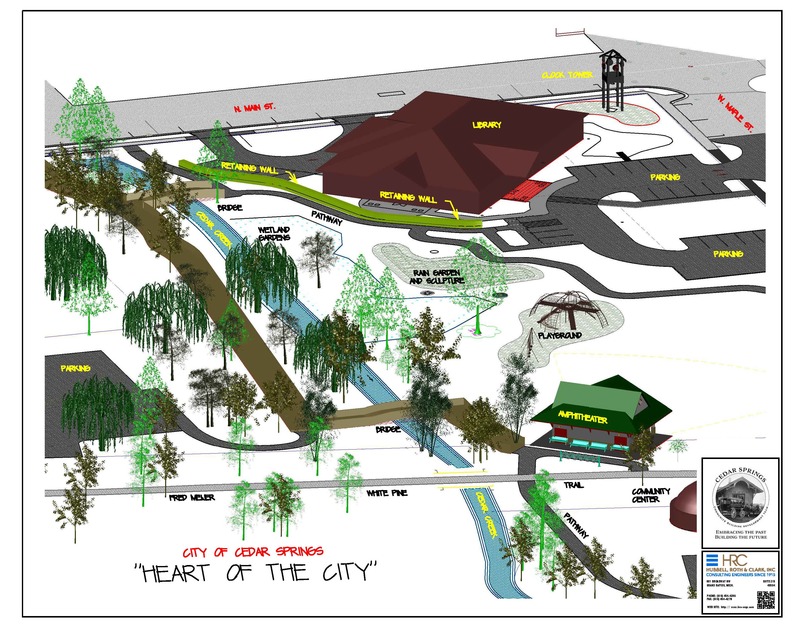 Two dozen organizations/businesses in Cedar Springs, along with dozens of individuals, have been working together for the past three years to develop ten acres of land within the city limits being referred to as the “Heart of Cedar Springs.” This new town square will be placed among beautiful rain gardens and sculptures along a boardwalk on the banks of Cedar Creek. The team overseeing these projects was organized in 2013 when representatives of local businesses, public and private organizations, Library Board members, city and school officials, and many community members started meeting regularly to discuss the future needs of Cedar Springs. They evolved into the Community Building Development Team (CBDT). A Capital Campaign Committee and other committees have been appointed by the CBDT to assist in fulfilling the vision and reaching goals. To date, nearly $2 million has been raised for various parts of the overall project from 92 donors, and another $1.1 million has been received through in-kind gifts of land acquisition, etc. Thousands of hours have been donated by professionals and by our local residents who are now looking for broader support to make this vision a reality. Cedar Springs is growing, evolving and becoming the next place to be in the greater Kent County area. Our residents are proud to live here and embrace the opportunity to welcome newcomers and visitors alike. Fundamentally, creating the “Heart of Cedar Springs” is about creating a town square where people can gather to collaborate, celebrate, and serve each other. It is about improving the quality of life, enhancing community pride and rallying around a vision for the future. While the concept of a town square is not unique, how Cedar Springs is embracing it today is. In a time of sprawling suburbs and disengaged neighborhoods, Cedar Springs is redefining in a forward-thinking way, how it views community. These plans and projects are as intentional as they are expansive. We are embracing the spirit of who we are today as a city and a community, and who we want to be in the future. The spaces developed into the “Heart of Cedar Springs” will draw business, culture, recreation, and education into a mutually beneficial community energized and equipped to provide the opportunities so needed in our area and will solidify Cedar Springs as the next place to be for many generations to come.